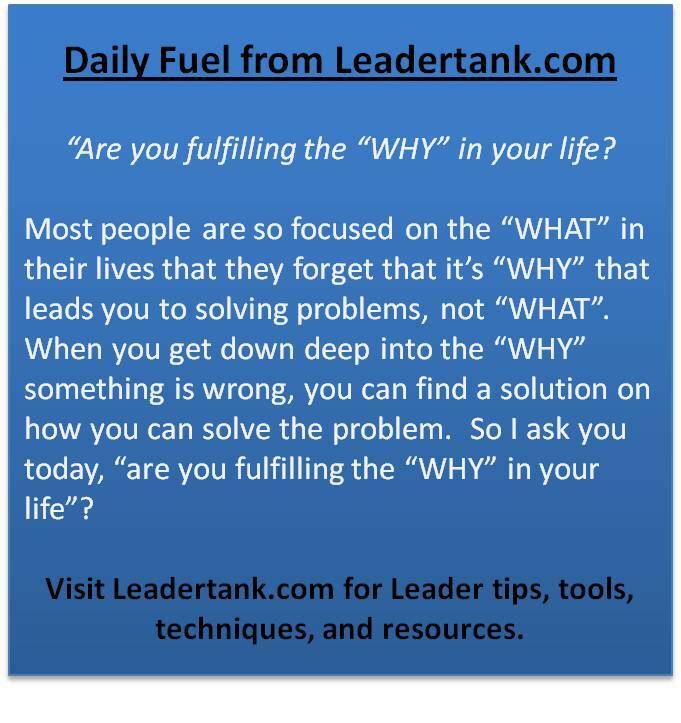 Are you fulfilling the “WHY” in your life? For more Daily Fuel click HERE. Every one of us has had something bad happen to us, and when it did, our thoughts, emotions, and attitude changed because of this significant emotional event. Now, I understand that some circumstances are extremely negative such as a death in the family, divorce, and getting fired from a job to name a few, but even in these situations, there can be positive from it. Let’s take a look below at some negative or stressful situations and look at the positive side of them. Someone talking about you If none of it is true then don’t worry about it, don’t try and defend yourself because that empowers the person talking about you. Just ignore it. Some people have nothing better to do than to feed off other people’s emotions, so don’t let them affect yours. Outside circumstances may try to intervene in you having a great day but you choose how you will react to those circumstances by having a positive or negative attitude. What I want you to understand is that attitude is a choice and that there can be personal gain, positivity, and happiness, regardless of circumstance. It’s all in how you choose to look at the situation; because every situation has its pros and cons, negative and positive, gains and losses, and so on. Remember that your attitude is a perspective that is controlled by you. If you look at situations from different perspectives then you can see all sides of the situation from many diverse interpretations. On the other hand, there are positive situations that can have a negative/stressful effect on you as well. Let’s take a look at some positives and their possibilities. In and of themselves, the previous listed are positive situations that can have a negative effect. But once again, you choose how you look at the situation whether it is positive or negative. Most people like to look at the negative side of any given situation and can cause undue hardship and pain on those that are trying to look at life in a positive manner. But, it’s up to you to have the right attitude. Your attitude is something you control. If you let someone control your attitude, you have just given your power away to that person and they have stolen your joy in life. Don’t let anyone steal your joy, choose to be happy. Choose the right attitude. Below are some tips that will help you stay positive in a negative situation. Pick which ever ones you want that will work for you or try them all out. Talk to others kindly. Remember, friction causes more friction. Anger breeds anger. That wraps it up for this edition of The Tank; I just want to leave you with the final thought of “actions lead to reactions”. Having said that, how you choose to react is completely up to you whether your reaction is positive or negative. Even though there are negative things that can happen every single day, how you choose to react to those negative situations are up to you. Believe it or not, there can be positivity from negativity. Have a great day and choose positively. If you believe this edition of The Tank was a positive influence and can be beneficial to someone, please feel free to pass it along to all your friends or tell them to visit Leadertank.com to download it. You can also get even more motivating and inspiring messages by reading Daily Fuel at Leadertank.com. For a more interactive leadership experience with me, feel free to add me as a friend on facebook, dropping me a line at Leadertank@gmail.com and letting me know you want to join my mailing list, or if you just want to talk, or ask me a question.